A little tire of the same old, same old when it comes to holiday decor color schemes? Us, too. Red and green is a classic combination, of course, but there are so many pretty and festive ways to use color when you're decking the halls and trimming the tree. From shades of blue and white to sparkling silver, gold and champagne tones, we found 10 beautiful and inspiring holiday color schemes that you can adopt when decorating your home for Christmas, Hanukkah and New Year's Eve, too! And don't forget that you can (and should) let the year-round vibe of your home influence your adornments, as Alaina Kaczmarskis did in her living room in this tour from The Everygirl. 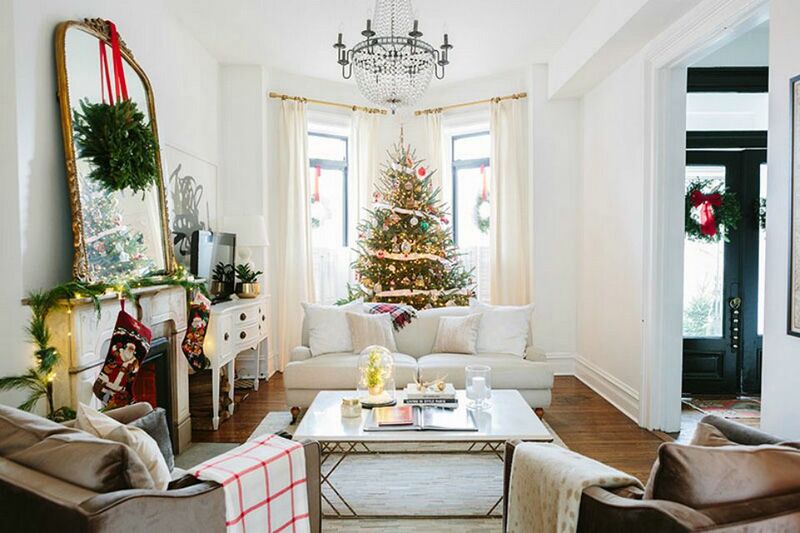 She used hints of fresh crisp greenery and lush red velvet ribbon add just a dash of holiday cheer to her mostly white Brooklyn greystone livingroom. See more pretty holiday color schemes ahead. When it comes to classic holiday decor color schemes, there's nothing more appealing than a sparkling, glitzy combination of silver and gold. Mixed metals look festive and bright without obstructing the color palette you have going in your home year-round. This pretty Christmas tree adorned with cascading ribbons as well as ornaments is displayed by Balsam Hill, where you can shop online for a variety of ornaments and decorations. No matter what holidays you celebrate during the festive season, be it Christmas or Hanukkah or another, we love a festive take on blue and white. It can be easily incorporated into your home, and we love how the combination looks when it's paired with greenery like trees and garlands. These two vignettes—using casual white and blue elements like macrame and yarn, as well as small, opaque orbs—come from a tour on The Everygirl, peeking into the home of Aniko Levai. We're drawing so much inspiration from Stephanie Vogler's holiday home tour in The Glitter Guide. How absolutely gorgeous is her ivory and white color scheme? The frosted white tree is adorned and practically spilling over with white, translucent, and ivory ornaments and warm twinkling lights. And her coffee table is layered with a tiny white floral arrangement and glass vases filled with white ornaments that shimmer and sparkle, only adding to the crisp and wintery scene. In the mood for something a little more bold and glamorous this holiday season? Why not think outside the traditional reds and greens, to beautiful jewel tones like fuchsia and rich deep blue paired with gold. On this fun and festive mantle we spotted on The Glitter Guide, the vibe is so cheerful and fresh. The stockings, ornaments and faux snow look distinctly "holiday," but with such an unexpected color twist you could almost leave it up all year! Bring out your inner ice queen this holiday season—the good kind! This gorgeous tree, trimmed in silver with flashes of ice blue (spotted on HomeDecorators.com) is almost too good to be true! Along with dazzling ornaments and garlands covered in clear gems and swirling icicles, choosing the twinkle lights on a white cord adds to the cohesive, monochromatic look of the tree. If your living room is already a colorful affair, why not make the absolute most of what you've got with a completely zany (but oh-so-cheerful) combination of hot pink and lime green? This look works well in this home featured on Run Me Home because the major furniture pieces—the teal couch and exotic print chairs—are also so bright and eye-catching. Additionally, the art really supports such an unusual holiday look, and it's all starkly displayed against bright white walls. Have a holiday party on the horizon but looking to keep it feeling fresh and feminine? (A bridal or baby shower, perhaps? Or December birthday!) Try setting the table with pretty pink and white florals with minty shades of greenery. In this tablescape set by The Glitter Guide, the hostess tied the napkins and set the places with festive little ornaments, which adds all the reminder you need of the season. Who says a color scheme has to incorporate more than one color? We love the way that Jess Ann Kirby, a blogger based in Rhode Island, has decorated her dining area for the holidays with simple greenery and white twinkle lights. She lets the vibrant and traditional pine garlands and wreath set the tone for a homey and cozy holiday dinner setting. This is a great option for anyone unsure of what colors to choose since the fragrant greenery will look festive in any home setting. For the traditionalists out there, we haven't forgotten you! Red and green are indeed the most recognizable colors of the season, and with good reason. Boughs of holly, candy cane stripes... You get the idea. To make it feel fresh, layer in a variety of shades—deep burgundy and cherry red with hunter green and bright young pine all go brilliantly together and give depth and interest to your holiday decor. This dramatic tablescape comes from Modern Dining Tables and shows how sophisticated this classic combo can still be. A bit of color scheme inspiration for your New Year's Eve party. In this instance, we love to rely on the classic colors of the holiday—glittering metallics! But adding a hint of black adds some sophistication and depth, plus, will support the energy of the party if you've asked your guests to dress up a bit! This fun display from Frog Prince Paperie uses a fun top hat as part of the color and decor, and could be used for photos later on!